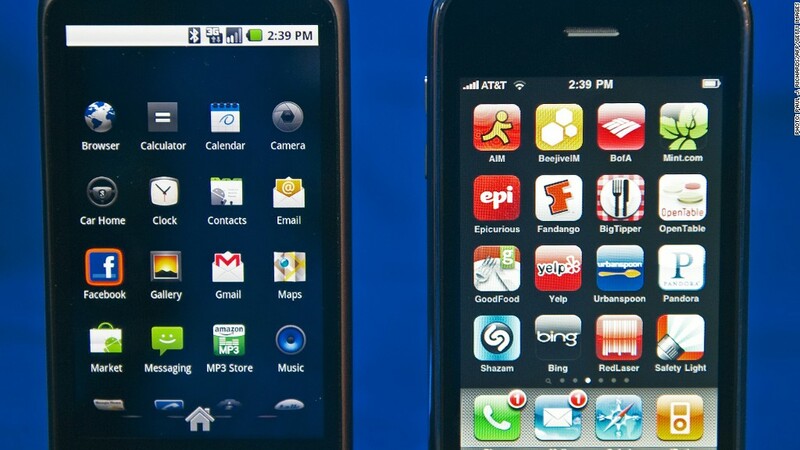 Android and iOS made up 85% of smartphone market share last quarter, according to an IDC report. The mobile space has quickly become a two-horse race between Google (GOOG) and Apple -- and one of those giants significantly widened its lead last quarter. Google's Android surged to a whopping 68% share of the global smartphone market last quarter. That's four times the 17% market share held by Apple (AAPL), according to a Wednesday report from research firm IDC. IDC, which tracks smartphone market share by operating system, said that nearly 105 million Android phones were shipped in the second quarter -- more than double the number shipped at the same time last year. Apple also showed strong growth, with an almost 28% gain over the previous year to 26 million phones shipped. "Android continues to fire on all cylinders," IDC senior research analyst Ramon Llamas said in the report, citing good prices and new phone models from Android's hardware partners as growth catalysts. More specifically, IDC pegged Android's gain "directly" to Samsung, which represented 44% of all Android phones shipped during the quarter. That's more than the next seven Android vendors combined, IDC said. Samsung's Galaxy S III debuted late in the quarter to favorable reviews. Apple and Samsung are currently locked in a heated court battle over Apple's allegations that Samsung illegally copied its iPhone design. Apple's iOS momentum was slowed this quarter by rumors that the iPhone 5 will be released in September. The iPhone 4S has been on the market since last October, so IDC said sales have "cooled." Meanwhile, Android and iOS's combined 85% market share didn't leave much room for competitors. Shipments of BlackBerry phones from Research in Motion (RIMM) fell a staggering 41% over the year to 7.4 million. That represented less than 5% of the market -- the lowest level since 2009, IDC said. It will be tough for RIM to improve its position this year, as the company said in June that its BlackBerry 10 operating system is delayed again until 2013. The once-popular Symbian operating system from Nokia (NOK) "sunk to a new nadir last quarter," IDC said, with shipments falling more than 60% over the year. Symbian now represents only 4.4% of the global market. Microsoft's Windows and the open-source Linux rounded out the last 6% of the market.